BBC - The Code: The Treasure, Unveiled! So the truth is out there. The eagle-eyed of you will know now what it is you’re playing for. If you were one of the 700 or so who applied for a unique postcard - and got one - then you were part of a sensational team who successfully deciphered the approximate shape of the prize through collaboration on Facebook and revealed it’s shape before we did. Each postcard was a thin planview slice of the shape, each with a unique code. Working together the team assembled them in the correct order, worked around the gaps and came up with a few 3D models which were really very close to the real thing. A seriously clever bunch. The real thing revealed on BBC News magazine this morning (27th July) is totally unique designed by Californian sculpter Bathsheba Grossman, known for her mathematcial sculptures. She attended Yale University studying Mathematics and Pennsylvania studying Fine Art – so you can see where she was going. 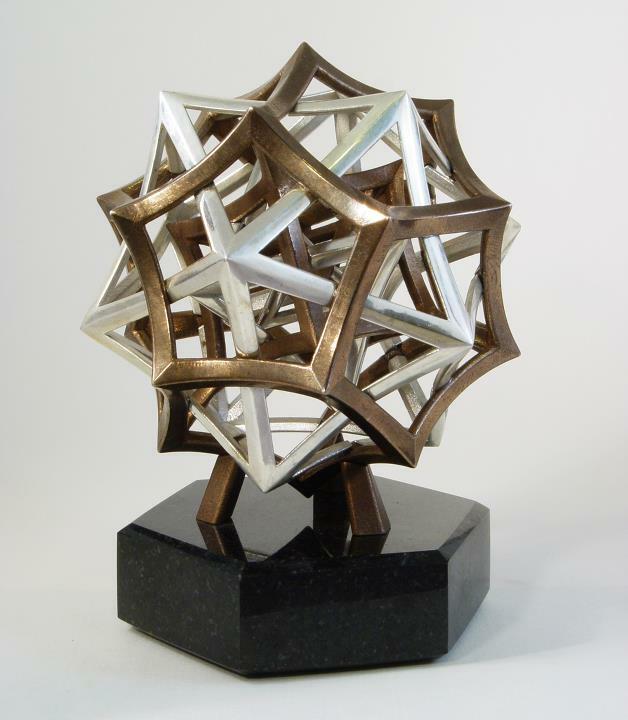 “This is a composition of the Platonic solids, the five polyhedra whose faces are all identical. They're fundamental to understanding order and symmetry in 3D space, and also dripping with golden ratios. She certainly thought it through. The prize sits on a hexagonal black granite base which will feature a lasered inscription of the winner’s name and the BBC and The Code logos. And here’s the best bit. The bronze/steel composite has been fabricated using the latest 3D-printing techniques, while the silver has been cast from 3D prints using the ancient lost-wax process, which dates back to pre-history The combination of ancient and modern technology is relevant to The Code. Mathematics is established in old trusted principles and processes while constantly adapting and changing with new ideas and discoveries. The Code Prize represents that. We hope that the winner will love this prize as much as we loved commissioning and making it. True beauty is in the ear of the Musician. Enjoyed episode 1 and looking forward to the next. Interesting to see the world in numbers and wonderful Chartres cathedral reflecting the spiritual, too. There are some good visual representions of PI and the Fibunacci sequence on the web - can you show some of these on your site - it will help non mathematicians appreciate the beauty. Also read about the music of the spheres many years ago - the harmonics of the universe - is there a symphonic version of this to listen to? I am confused that 1.618 or 0.618 was not mentioned on this weeks show and in fact when measuring the Nautilus shell 1.8 was mentioned instead. And so will we also get around to 137 and not mention that also? I'm sorry - I hated the programme. So enticing - Chartres, the nautilus. I expected something really good. One might say that the "Golden Hare" hunt aspect of it might attract new people to the area of mathematics - but for me it fell between two stools. What was the good of talking about pi as a mystic number disappearing into a universe, without also explaining that it is a simple ratio? Twenty two divided by seven. And maybe explaining that getting a perfect answer to that sum is as likely as producing a perfect circle? I understand (now) that this is linked to a multimedia exercise - and I hope that you've got it right. For me, though, as a TV programme it was scrappy. du Sautoy uses terms such Laws, Codes and Evolution in the same sentences. For example when I look at traffic laws I know some one had to think about those laws and put those laws into practice. A mind, intelligence was behind those simple laws, in other words a law maker. Morse code, very simple but we all know that an intelligent mind was behind that code. What about the far more complex DNA code or the codes governing the universe am I suppose to believe that these far more complex codes came about without an intelligent code maker. The point is: If a simple law or code needs a law or code maker then the far more complex laws and codes governing life and the universe also need an intelligent law maker. Who or what is that is that law maker? Evolution is certainly not the answer. I find your points interesting but i find the conclusion flawed. A code can be consciously created, or not. Codes can be seen through all scales of everything, intrinsically and extrinsically. From what people do in all aspects of life, repetition creates patterns and therefore a manner of code, doing the dishes in your sink after you've finished eating, for example. Down to patterns in molecules and further with the patterns in vibrating strands of energy, which make up the whole of existence. When you make something out of wood, its always made out of wood. We are born of patterns. With repetition and patterns and any scale of variation, there is evolution. What makes you doubt Evolution? Do you not think that there is possibly a bit lacking in translation and meaning of holy books. Think about Dickens or Shakespere, written in English, but both lose some meaning over time, making it tricky to fully understand what is actually being communicated, so with a couple of millennia of use, any text could end up with a flawed perception of the true meaning,by misinterpreting fables and metaphors as fact, and the other way round, human error. Do you think that a deity would have tried to explain the complex systems that have started from the big bang to bring us to this point? Imagine trying to explain DNA to someone who would have been relatively, to our standards anyway, poorly educated, a couple of millennia ago. When "returning" to an omnipresent deity, do you reckon that instead of meeting a really large bloke or a ray of light and going somewhere, you return to what makes up everything. The cup of tea next to your keyboard will contain down to the nth degree something consumed by Charles Darwin, or Bill Clinton, be it a water molecule or just a Hydrogen atom, he, as we all will, are going to fully return to being truly omnipotent, part of the world, part of the universe, part of creation in its entirety, with the creator, the purest truth to the nth degree? This blog was to support people playing The Code online treasure hunt. The final was won by Pete Ryland of London in September 2011 and as such the blog is now closed to further comments. However, you can still find handy hints and updates if you are playing for fun! You can stay up to date with The Code via these feeds.